High-definition television has brought us better image quality on screen, but that sharper picture doesn’t conceal facial flaws like analog television did. Makeup companies have to keep up with these constant changes in technology, and they’re bringing us the latest trend, the new generation of high-definition foundations. 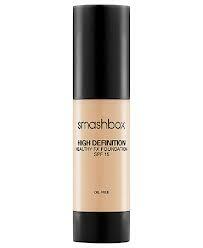 These foundations are designed to give flawless coverage; under the harshest lighting, they go undetected.